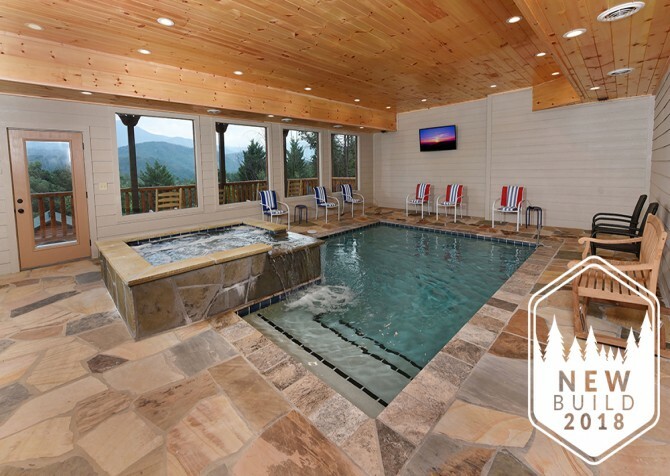 Welcome home to Hickory Splash Lodge, a gorgeous new build at 3,000 square feet in Sherwood Forest Resort, where lodge-like style meets a cozy cabin atmosphere in the Great Smoky Mountains. A blend of wood stains and trims gives the spacious cabin a high-end look, while tons of amenities make you feel right at home. Relax with , create awesome group meals in the fully equipped kitchen, lounge in the spacious living room by a toasty fire, play for hours on end in the game room, soak away your troubles in the outdoor hot tub, and make every night movie night in the private home theater! 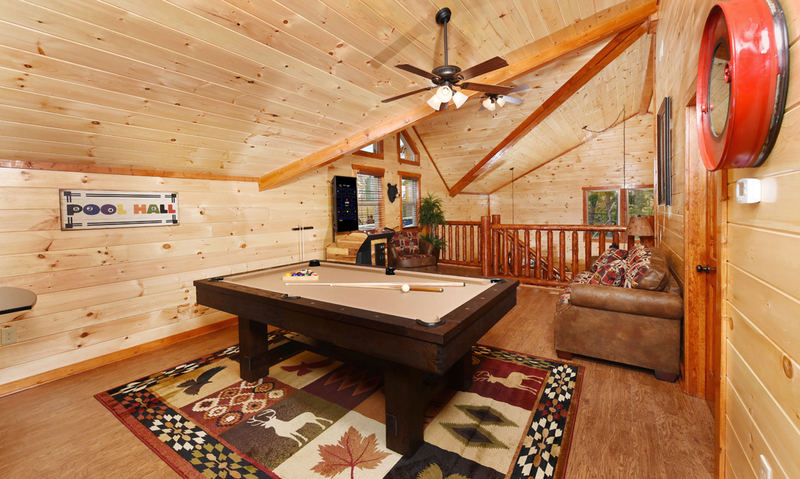 This 3-bedroom, 3.5-bathroom cabin for 12 guests in Pigeon Forge also boasts plenty of other perks, including a big screen TV and DVD player, TVs in the bedrooms, rocking chairs, a washer and dryer, and high-speed wireless internet. 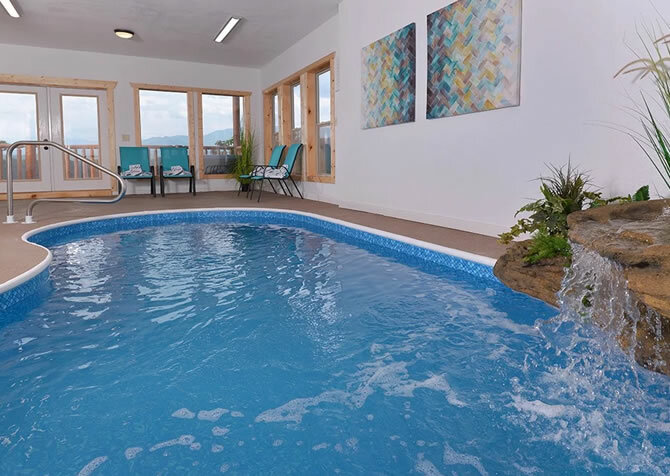 And don’t forget what may be your favorite amenity: a private indoor pool! It’s perfect for splashing, swimming, and relaxing year-round! Want to soak up the summer sun? Hang out at the resort’s community pool! Be it a family vacation, couples retreat, group getaway, or team-building trip, Hickory Splash Lodge not only features everything you need to host a successful Smoky Mountain stay but also provides ample opportunity to create lifelong memories and cherished moments. After exploring the home, choosing bedrooms, and stepping onto the decks to soak in the fresh mountain air and beautiful views, take a well-deserved rest on the living room sofas and arm chair — complete with plump pillows in case a nap calls. Once settled in, arrange a few snacks or a card game on the coffee table, watch a funny show or DVD on the big screen TV, or simply enjoy a group chat in comfort. With a gorgeous stone fireplace as the focal point and a rustic-industrial chandelier overhead, this living space feels warm and inviting as soon as you step inside. Close by awaits the kitchen, where you’ll have an island for prep space, stainless-steel appliances, and the tools and dishes you need for in-cabin meals. Sit the kids at the bar for 2 so they can lend a helping hand, grab fresh ingredients from the fridge, whip up homemade recipes on the stove, and load the dishwasher as you go to keep the mess to a minimum. And with an open floorplan throughout the space, you can keep conversations going while chopping, brewing, toasting, frying, blending, or baking! When the cheesy pizza arrives or when Grandma’s secret recipe is ready, gather everyone in the dining area for a delicious meal — the best way to spend a little quality time together. Featuring a rustic design, 2 end chairs, and 2 matching benches, the elegant dining table complements the unique chandelier overhead. Paired with natural light pouring in through the large windows, this space is not only great for group meals but also nice for arts and crafts with the kids, journaling, or catching up with emails. There’s even a bistro nearby, perfect for laying out a sandwich spread at lunchtime or an array of tasty desserts after dinner. Looking for a space to entertain the kids and kids at heart? 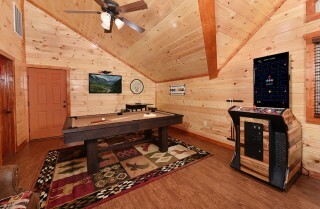 Head to the rec room in the loft for friendly matches with the pool table and exciting game battles on the flatscreen arcade unit — boasting 60 fun games! Not interested in playing but don’t want to miss out on all the action? Relax with a cold one at the table for 2, kick back on the sofa, or chill in the arm chair with a trendy magazine. As a bonus, the couch doubles as a sleeper, so the youngsters can play all night and hit the hay when they please with ease. While the gamers vie for first place, sneak away to the private indoor pool downstairs to relax. Enjoy a few tranquil laps, splash with the little ones, or wade around for a while. During the day, unwind with a good book or a cool glass of sweet tea by the pool while the kids play Marco Polo in the water. 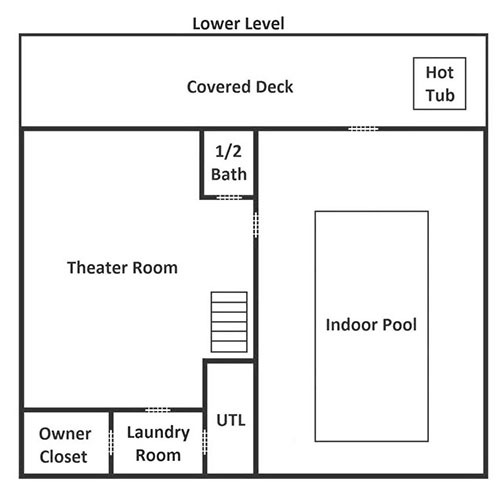 You’ll also have direct access to the lower-level deck, meaning alluring views and a relaxing hot tub soak are mere feet away! Tired from the day’s activities but can’t sleep from all the vacation excitement? Hickory Splash Lodge understands. After a soothing, hot shower, slip into your PJs and head to the theater room downstairs for an epic movie night — complete with a mounted big screen TV, DVD player, and elevated theater-style seating with drink holders to boot! Spread out a pillow pallet for the kids, dish out bowls of parmesan-topped popcorn, and select your drink of choice before the show begins. What makes this home theater extra special? The kitchenette and bar table for 4 of course! Forget about walking upstairs for refills; the stainless-steel microwave, mini fridge, and sink make preparing snacks and cocktails a breeze. 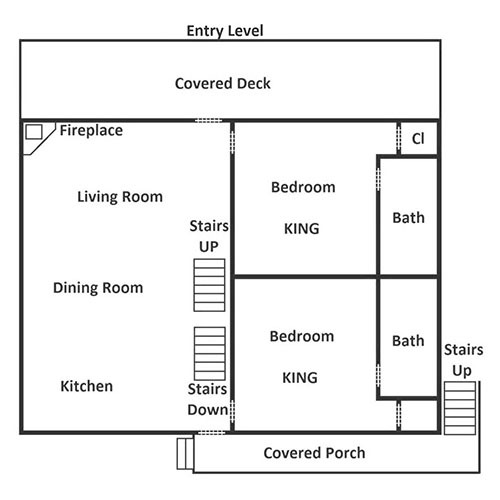 And there’s a half bath just down the hall for convenience. After spending days exploring the Great Smoky Mountains National Park and playing in exciting Pigeon Forge, come back to Hickory Splash Lodge for peaceful nights. This 3-bedroom, 3 ½-bathroom cabin has 2 king-size beds on the entry level, a queen-over-queen bunk and full-over-full bunk upstairs, and a sleeper in the game room for extra space. Each bedroom features a mounted flatscreen TV and a private en-suite bathroom, combining comfort with entertainment for all. 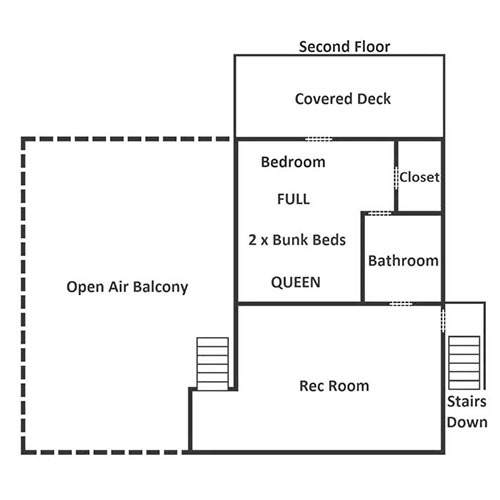 And the loft bedroom has direct deck access, providing serene mountain views at the twist of a doorknob. After a smooth ride over paved roads to the cabin, park up to 5 vehicles — including motorcycles — in the flat, paved parking area, walk up 3 steps to enter the home, and let your Smoky Mountain vacation begin — it’s that easy! And with so many entertaining amenities inside, you can expect relaxing outdoor spaces as well at Hickory Splash Lodge. 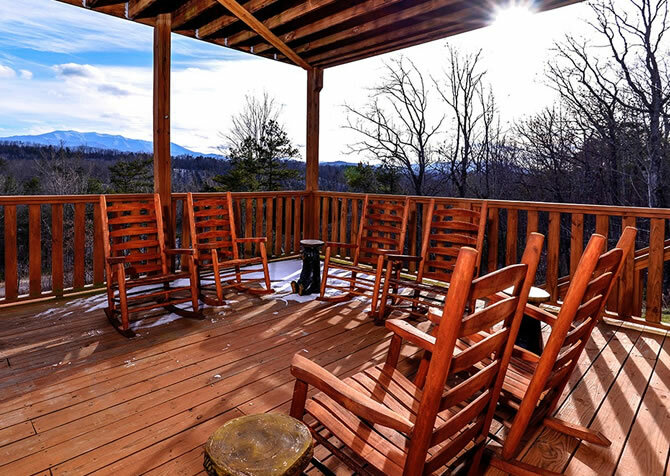 Sip coffee or tea in a rocking chair every morning with beautiful mountain and woodsy views, soothe tired muscles after a refreshing hike in the hot tub with handy hooks for robes and towels, and throw an epic barbecue party with the charcoal, picnic-style grill. Speaking of awesome amenities, a stay at Hickory Splash Lodge includes high-speed wireless internet to browse local deals online, a washer and dryer to keep clothes and towels fresh, and community pool access through Sherwood Forest Resort to sunbathe and swim outdoors in summer! A mere 10 minutes from the center of town, Hickory Splash Lodge offers you and your guests close access to Pigeon Forge attractions, restaurants, and shops. Beat every high score at the arcade, soak your friends on the Blaster Boats, spin to your heart’s content on the Bears Go Round, and race to the finish lines on thrilling go-kart courses at The Track Smoky Mountains! Leave silverware behind and dine with family and friends at Dolly Parton’s Stampede, an incredible show featuring horse-riding stunts, agile acrobatics, exciting pyrotechnics, skilled dancers, marvelous music, and more! Bounce around with the kids, flip if you can (safely), and bring back childhood memories at TopJump Trampoline Park, harboring a daredevil climbing center, nimble ninja course, sports and kids zones, and a fun arcade next to the candy shop. "We stayed at this cabin with our four boys (ages 10, 8,6, and 2). This cabin was amazing. The kids were entertained the entire time either with the pool, hot tub, pool table, arcade games, or movie theater. This cabin surpassed our expectations. Everything was…"
"We stayed at this cabin with our four boys (ages 10, 8,6, and 2). This cabin was amazing. The kids were entertained the entire time either with the pool, hot tub, pool table, arcade games, or movie theater. This cabin surpassed our expectations. Everything was well maintained and very clean. I would book this cabin again in a heartbeat." Thank you so much for this amazing review! We are so happy to hear that Hickory Splash Lodge surpassed your expectations as well as providing the perfect entertainment for your guests, and we hope to serve you and your guests again soon! "Stayed at Hickory Splash Lodge last weekend. Perfect location, felt away from the crowds, but SUPER convenient to all the attractions in Pigeon Forge. The cabin was beautiful and we had a great time playing the arcade games and pool. Picture perfect end to the day in the hot tub under the stars."